Add Opioid Epidemic as an interest to stay up to date on the latest Opioid Epidemic news, video, and analysis from ABC News. Months in prison didn’t rid Daryl of his addiction to opioids. “Before I left the parking lot of the prison, I was shooting up, getting high,” he said. Daryl had used heroin and prescription painkillers for more than a decade. Almost four years ago, he became one of more than 200 people who tested positive for HIV in a historic outbreak in Scott County, Ind. After that diagnosis, he said, he went on a bender. But about a year ago, Daryl had an experience that made him realize he might be able to stay away from heroin and opioids. For several days, he said, he couldn’t find drugs. He spent that time feeling terrible because of withdrawal sickness. His friend offered him part of a strip of Suboxone Film, a brand-name version of the addiction medication buprenorphine that is combined with naloxone. 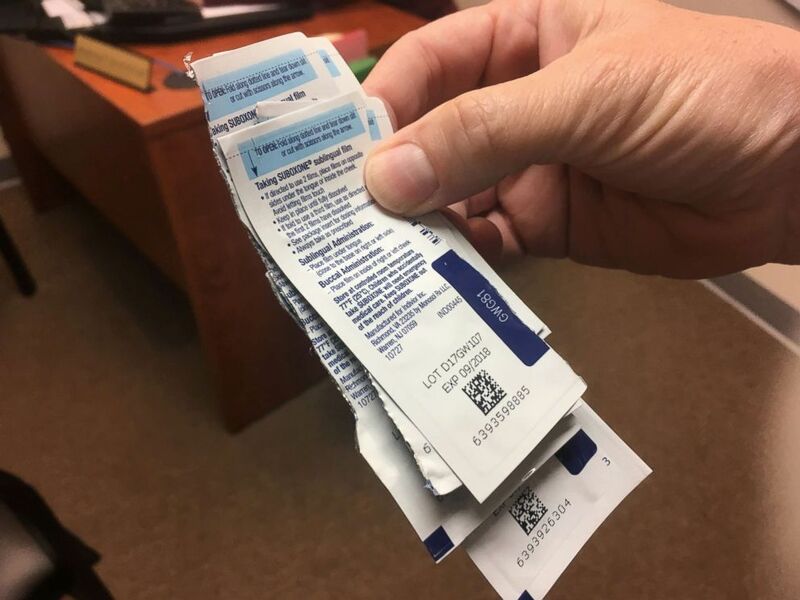 Staff at CleanSlate, an addiction treatment center in Anderson, Ind., count patients' Suboxone wrappers to make sure they adhere to their buprenorphine regimen. Buprenorphine is a long-acting opioid that is generally used to treat opioid addiction. It reduces cravings for the stronger opioids he had been taking, prevents physical withdrawal from those drugs and comes with a significantly lower risk of fatal overdose. Weeks later, the grind of chasing heroin had worn on him. Buprenorphine controlled his withdrawal symptoms longer, and Daryl decided to use it to stay away from other drugs. “I didn’t crave nothing. I wasn’t sick. My belly didn’t hurt. I wasn’t hurting in my joints,” he said. Buprenorphine is one of just three federally approved medications to treat opioid addiction. It’s an opioid itself, so some people misuse it — they snort or inject the medication. And patients who have prescriptions for buprenorphine sometimes sell or give it away, which is known as diversion. Some policymakers and officials point to diversion as a reason to further increase regulations. Providers already need to be certified to prescribe it, and there’s a cap on the number of patients they can treat with the drug. 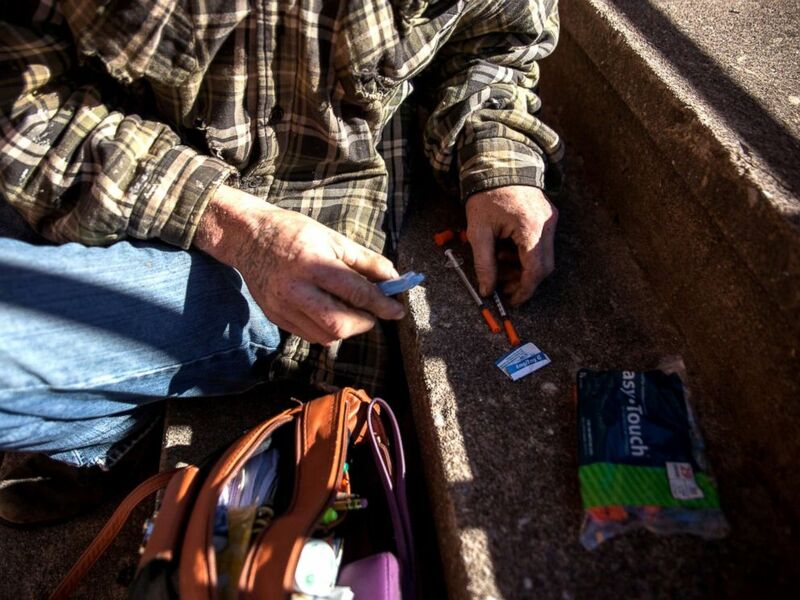 Daryl, who has had an opioid use disorder for more than a decade, prepares to inject Suboxone he bought on the street. He said it helped him remember what being normal felt like. But addiction treatment professionals argue the problem of buprenorphine diversion is often misunderstood. A black market exists in part, they point out, because addiction treatment can be hard to find. President Donald Trump is expected to sign a bill that would increase access to the medication, but it’s unclear how quickly that access will grow. In the meantime, many people dealing with addiction will turn to the black market for buprenorphine — sometimes using it to get high, sometimes using it to prevent withdrawal until they can get something stronger and sometimes using it exactly as it is intended to be used: to treat addiction. Dr. Kelly Clark, president of the American Society of Addiction Medicine, which supports the measure that would increase access to buprenorphine, contends that making the drug more widely available outweighs the risk. For one thing, buprenorphine is not as dangerous as other opioids. “The risks of overdose with buprenorphine are minimal,” she said. It is possible to fatally overdose on buprenorphine — especially if users don’t have a tolerance to opioids or they mix it with other substances. But that is rare. Buprenorphine’s effects are less potent than those of heroin and fentanyl, and the medication can block other opioids’ effects. Because of these attributes, few people use buprenorphine to get high. Instead, more people use it to prevent withdrawal and to stay away from other illegal drugs such as heroin and illicit fentanyl. 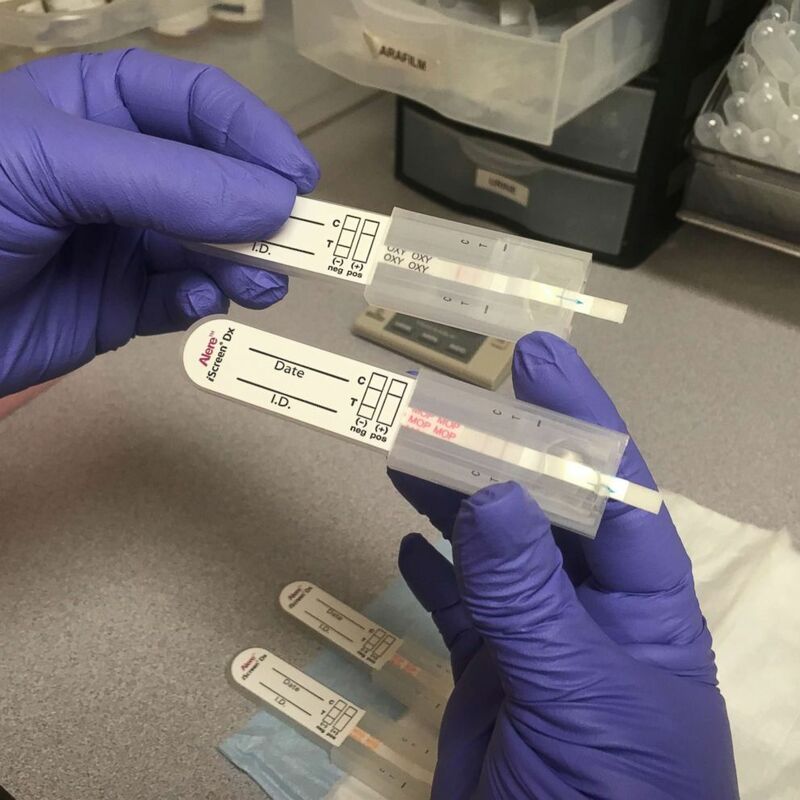 A staff member at CleanSlate, an addiction treatment center in Anderson, Ind., tests patients' urine to make sure they adhere to their buprenorphine regimen. Some leading addiction experts argue that self-treatment with buprenorphine can save lives because it is used in place of more dangerous substances that are blamed for the continued rise in overdose deaths. People often try to treat themselves when they struggle to obtain real treatment, said Dr. Michelle Lofwall, an addiction specialist and researcher at the University of Kentucky. “These people want help, and they tried and they didn’t succeed. So now they’re going to go get it if it’s available,” she said. Professional treatment with buprenorphine can be difficult for patients to get. Prescribers need a special waiver to prescribe the medication, and federal rules limit the number of people they can treat, a cap that is specific to buprenorphine. Federal guidelines changed under the Obama administration to increase the number of prescribers and the number of patients they can treat. Nurse practitioners and physician assistants can now apply for a waiver to prescribe buprenorphine, and doctors who meet certain requirements can now treat up to 275 patients — that’s up from the previous limit of 100. The new bill on its way to Trump’s desk would let more nurses prescribe buprenorphine and allow some doctors who recently got waivers to treat more patients. Amid these efforts, some law enforcement officials and policymakers have said that more regulation and enforcement actions are needed to stop diversion. But Basia Andraka-Christou, an assistant professor and addiction policy researcher at the University of Central Florida, said increasing regulations or shutting down prescribers would limit treatment options for people addicted to opioids. Getting Suboxone on the black market is obviously not ideal. Addiction is a complex, chronic disorder and patients need comprehensive care. That means a treatment professional to help them figure out the proper dose and counseling to address other mental health needs that are common among people with addiction. But Lofwall said people addicted to heroin or painkillers often realize they want professional help in quitting after trying buprenorphine illegally. Daryl had that sort of experience. Several weeks after he began using buprenorphine regularly, Daryl tried to sign up for insurance so he could get help — medication and counseling — in staying away from other opioids. “I think if I had never started [Suboxone] on the street, I wouldn’t have no interest in doing nothing but getting high,” he said. Daryl still hasn’t made it into treatment. He had trouble starting his insurance, and the market for illicit buprenorphine can be fragile. Daryl struggled to stay away from heroin when the person from whom he bought buprenorphine lost the prescription. Addiction can take years to conquer, and many attempts, but Daryl said his time on buprenorphine allowed him to see a way back to a normal life. This story was produced in partnership with NPR, Side Effects Public Media, and Kaiser Health News. A longer version of the story appears in Side Effects’ podcast The Workaround.